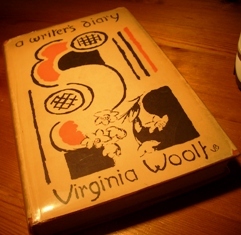 I'm delighted that this term's Woolf for Dummies set books include A Writer's Diary because this rather lovely edition has been sitting loved but a trifle misunderstood on my shelves for too long now. 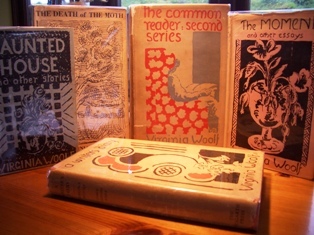 That lovely Vanessa Bell artwork and a first edition probably completely devalued by previous owner's annotation but I love the look of it.In a way I'm pleased because there's something sad about first editions like this being too precious to handle and I now feel perfectly justified in adding my own annotations too. 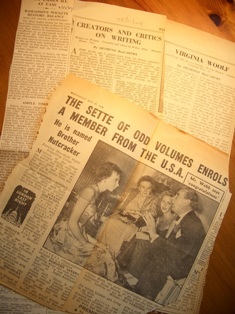 It came full of those mysterious yellowing newspaper cuttings that you often find and which must have held enormous significance to the cutter but are just faded symbols of times gone by for me. While I'm on the subject, can anyone tell me why these covers are no longer published? Is this a copyright issue? Wouldn't these books sell in their droves if they went back to these?